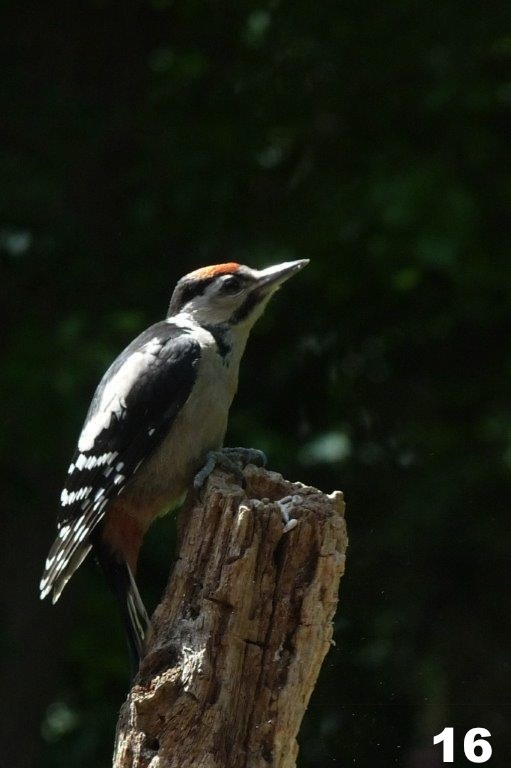 Are Selsdon Wood Great-Spotted Woodpeckers claiming Non-Dom status in Brookscroft Woodlands? 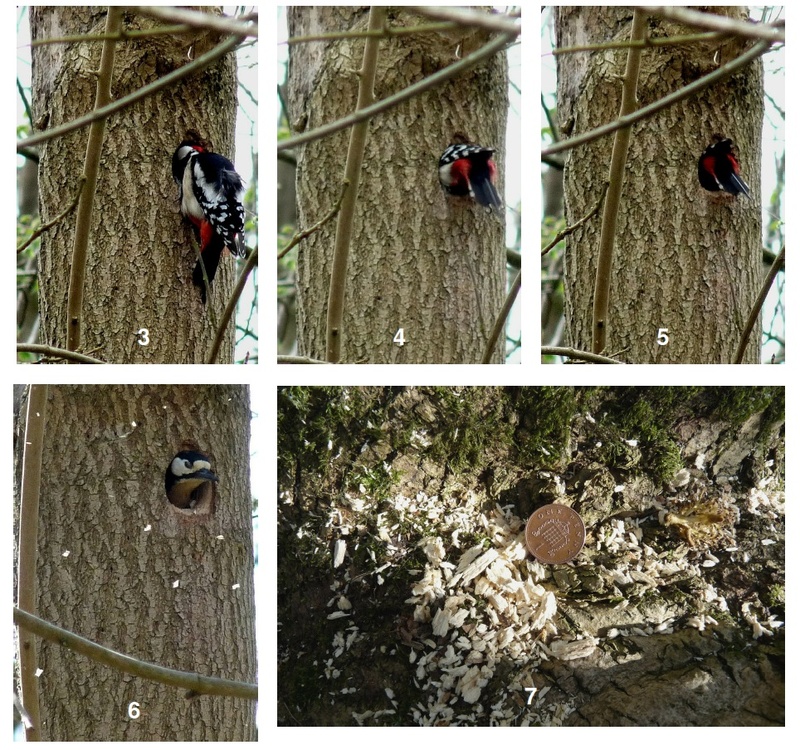 Early in April 2015 a pair of Selsdon Wood woodpeckers excavated their nest in Brookscroft Woodlands. From their point of view both areas are part of the old Court Wood. In addition this site offered unparalleled restaurant and take-away services in a Brookscroft garden close by. 14th April - I was sitting on our settee when I spotted that they had already started work (pics.1/2 above). 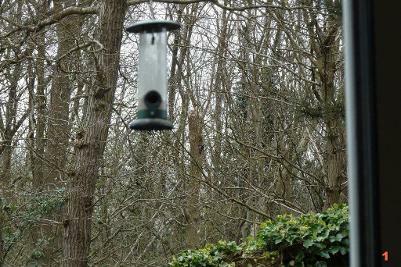 The woodpecker at the nest site can just be made out in the centre of picture 1 slightly below and to the right of the bottom of the birdfeeder. 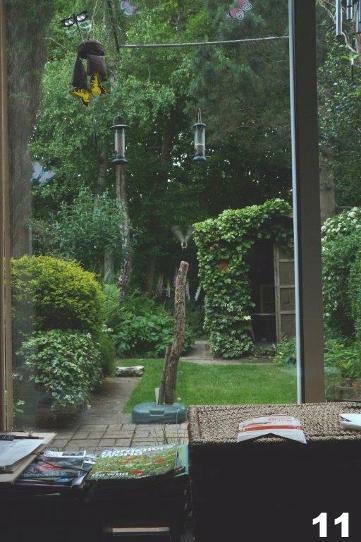 The following pictures were either taken from this vantage point through the picture window (28m. from the nest tree) or from the garden (about 13.5m. from the tree - the nest being 4.25m.up it). The camera was a Panasonic DMC-FZ28 bridge x18 zoom on a tripod. Both birds dug the hole. First digging deeper and deeper from the outside (pics 3/4/5), then getting inside and flinging out the chips of wood (pic 6). The chips, up to 2cm. long, built up under the tree (pic 7). 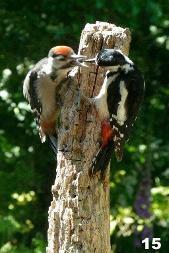 The woodpeckers were seen mating. 21st April - the pair started taking it in turns to sit on the eggs. The male was seen carrying out minor adjustments to the approx 52 x 70mm. hole (pic 8 below) - the female doing most of the incubating. 7th May - the eggs hatched. Both parents started foraging for food and from time to time augmenting the diet. 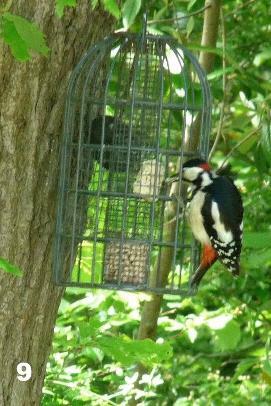 The male coming down to feeders for RSPB super-suet (suet plus seeds etc.) (pic 9). The female favoured the 1.2m. rotting log mounted outside the picture window - 3.5m. from the camera (fig 10). She then carried it back to the nest (pic 11). 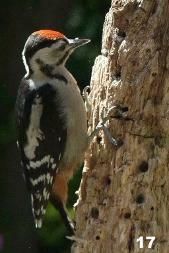 I had drilled about 20 holes in the log and repeatedly injected them with super-suet. I used a cut down ballpoint pen barrel with a round headed nail plunger. 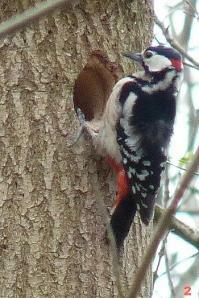 20th May - the loud repetitive ‘chitting’ call of the young could be heard whenever the adults were away. 24th May - the first head was seen protruding from the nest hole. (pic 12 above). 26th May - it appeared that the male had got fed up with the incessant clamour and disappeared. The one parent family was now only fed by the female (pic 13 above). 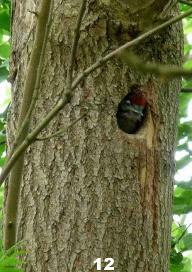 29th May - the woodpeckers fledged. The female was kept busy collecting food, before flying off to feed them (pic 14 below). How many? We did not know. One seemed to frequent nearby trees but the female also disappeared to other areas. 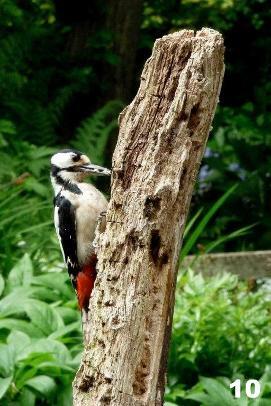 11th June - eventually one juvenile started coming down to the log to feed or be fed (pic 15). On one occasion a juvenile was seen to chase another away. 17th June - one juvenile was appearing but now independent of the female. (pic 16). 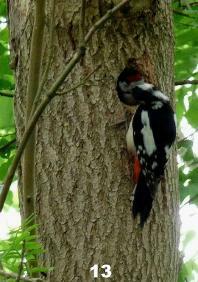 5th July - a juvenile was found dead by the feeders. A gash on the underside of a wing joint was the only discernible mark on it. 7th - 25th July - another juvenile (pic 17) appeared. It and the female continued to visit separately several times a day. 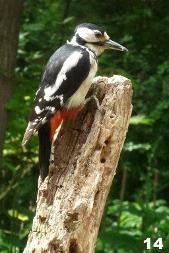 6th August - the 2 woodpeckers are still visiting.